Is your mirage band really “the best it can be”? Or is it actually allowing warm air to flow in front of your scope, causing mirage? 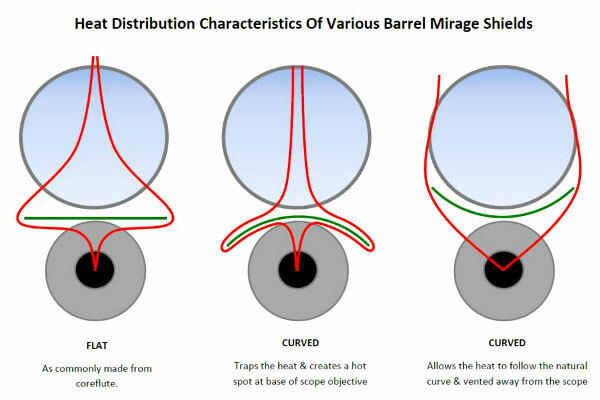 Here’s an interesting graphic that suggests that the size, shape, and curvature of a mirage shield can make a difference. We can’t say this diagram is based on exhaustive scientific testing (and we think the flow patterns are exaggerated for effect), but it does illustrate how airflow can be altered by shield shape. This graphic comes from Fierce Vinyl a company that produces high-quality aluminum mirage shields for shooters. Fierce Vinyl is run by the daughter of ace gunsmith (and Hall of Fame shooter) Thomas ‘Speedy’ Gonzalez. Fierce Vinyl sells custom 26″ aluminum mirage shields (with graphic imprint) for $21.99 + shipping. That price includes printing the graphic on the shield, if you provide the artwork. Inquire about custom art designs or large orders. Along with Mirage Bands, Fierce Vinyl produces a variety of graphic products, labels, and stickers. If you need a placard, graphic, or bumper sticker for your business or shooting range, Fierce Vinyl can help you out. See more product designs on the Fierce Vinyl Facebook Page. Share the post "Tech Tip: Mirage Shields — They Aren’t All the Same"
We can’t say this diagram is based on exhaustive scientific testing (and we think the flow patterns are exaggerated for effect), but it does illustrate how airflow can be altered by shield shape. The mirage shield I made for my F-Class rifle cost about 50 cents and I’m sure I could have done it cheaper. I bought a 4″ piece of aluminum roof flashing and cut down the middle with a pair of scissors. I bent a curve in the middle, the same as the ones advertised and it rolls up to go in a 2×3″ diameter cardboard tube. Before I get accused of being too cheap, this is used on a $3K (before scope)custom rifle. It works great. These will probably sell like crazy to those who have more money than sense. Then there are the rest of us that think spending 1/50th of the money for the same result is a better idea. Ryan: Good tip. On the Daily Bulletin we have published stories on how to make your own Mirage Shield, as you did. But we will say, for those who want a color GRAPHIC on their shield — to advertise a team, club, or business — $21.99 is a very reasonable price. The purported heat flow “logic” escapes me. It appears that on the left and center the mirage/heat “flow” is in front of the scope and the right image it is at or behind the objective. Why would the right image not converge earlier – or conversely, why would the left image not tend to go more vertical after clearing the edge of the flat shield? Also, why would the right image not have a below-shield path more similarly straight up and then curve around the shield. My take is that there is ZERO science around this “statement” and what is shown is, IMHO, quite unlikely to be an accurate representation of actual heat flow characteristics. Finally, if you look at their site, the company is selling graphics applied on various surfaces – about 98% of the site content has zero to do with shooting. I can also add that should a person have thermal imaging gear (as has also been done) they will see there is quite some representation of the images (and yes…drawn as in indicative reference and not to scale and all the other stuff basically to try and keep the image as simplistic as possible) so take from it what you will. I don’t use white shields because they reflect sun rays back into the objective end, creating more mirage. I cut pieces of vinyl siding to a width of 2″ and paint them dull black. Fierce Vinyl appears to be kaput.